MANILA, Philippines – The red carpet premiere of “Rurouni Kenshin: Kyoto Inferno” didn't start until 6 p.m. However, fans were already waiting for the stars of the hit Japanese movie as early as three in the afternoon at the Event Center of SM Megamall in Mandaluyong City on Wednesday, August 6. The movie's main stars Takeru Satoh (who plays Kenshin), Emi Takei (Kaoru) and Munetaka Aoki (Sanosuke) graced the red carpet premiere, along with director Keishi Otomo. 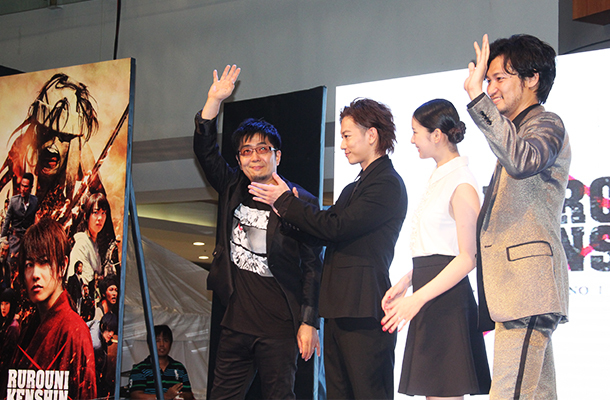 The Manila premiere of “Rurouni Kenshin: Kyoto Inferno” is the only premiere event of the movie outside Japan. The movie premieres in the Philippines on August 20, while it premiered in Japan on August 1. Takeru Satoh said he prepared for the role of Kenshin "swinging the katana" three months prior to the shoot of the film. “Kumusta. Ako po si Takeru Satoh. Masaya ako makita kayo,” greets the main star of the movie, much to the delight of the fans, some of whom attended the event dressed as characters from the movie. “I heard that Rurouni Kenshin broke the record of any Japanese film shown in the Philippines,” Takeru said through a translator. The 25-year-old actor added he can't believe “Rurouni Kenshin: Kyoto Inferno” will be shown in the Philippines just a few days after the movie premiered in Japan. He further said, “I believe it is thanks to all of you." “Thank you so much for such a warm welcome. I'm very surprised. Thank you so much,” Emi said, who noted it was her first time to attend a movie premiere outside Japan. 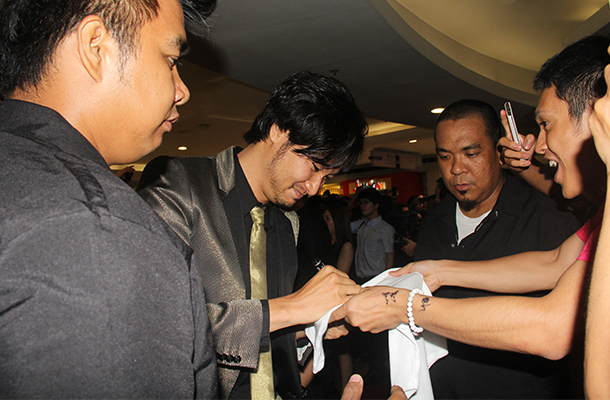 Takeru, Munetaka, Emi, and their director Keishi reciprocated the warm welcome they received from their Filipino fans by obliging to photo and autography requests of fans waiting by the red carpet. As a result, the “Rurouni Kenshin” director and stars took more than thirty minutes to walk from the Megamall lower ground floor entrance to the stage in the middle of the mall's even center. Takeru, Munetaka and Keishi will attend a public press conference for “Rurouni Kenshin: Kyoto Inferno” on Thursday, August 7, at the Glorietta Activity Center in Makati City.